With a history that started back in 1998 with entry-level luxury cars, Lexus further planted its engineering in four-door sedans and five-five door wagon. It was 2006 when they stepped for the two-door models, starting with convertible to coupe and here they are with third generation IS model, the Lexus RC F Sport 2015. 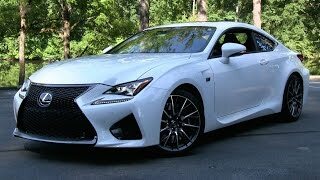 Let us see what’s new in it through review of Lexus RC F Sport 2015. Interior of Lexus RC F Sport 2015 is aggressive and sporty with its arena. Holding resemblance with RC F sport through its seats, gauges, pedals and steering wheel, Lexus RC F Sport offers you three color options for ultra comfortable leather upholstered seats. While the front seats are integrated with foam providing better seating for driver and passenger the rear seats feature high headrests following the same sewing pattern as in front seats. Some of the technological features making it distinct are, touch-operated Remote Touch Interface with upgraded version of Blind Spot Monitoring. Cabin is luxurious and spacious with aluminum and carbon-fiber trims adoring the entire interior of Lexus RC F Sport 2015. Exterior of Lexus RC F Sport 2015 is undoubtedly an aggressive piece of work. Starting with the front fascia of Lexus RC F Sport you have the huge spindle signature grille of company. Hood gets a bit raised stance to house its massive V8 engine. L shaped air outlets are inculcated in both front and rear fenders to drag out the hot air from engine. Lexus RC F Sport is also aerodynamically worked out to assure better drive experience. Moving towards the rear fascia of Lexus RC F Sport 2015 you’ll notice sports exhaust system with stacked-trapezoidal and quad-outlets adding to the unmatched sporty look. The entire sporty and aggressive exterior rolls over the stunning 10-spoke 19” forged aluminum alloy wheels. The Lexus RC F Sport 2015 gets its power through a 2.5 Liter Dual-injection four-cylinder petrol engine delivering 176 hp and peak torque of 221 nm. This power gets accompanied by the additional 141 hp coming through an electric motor. 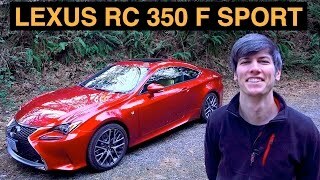 Thus the total power rumbling the wheels of Lexus RC F Sport 2015 sums to 217 hp.